It's been about one month since I last posted. If you were wondering what happened to us, I started back to work on Feb. 1. This has been an adjustment. I seem to be very busy at work and then I come home and stay very busy until bedtime. So, needless to say, I have not had time to post. 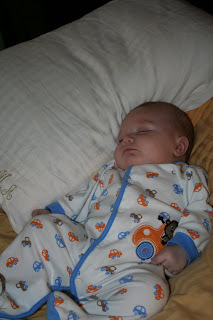 Having two kids is actually much more difficult than one! 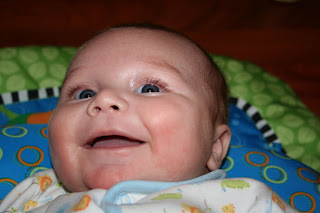 Anyway, here are a few pics of our February. I'll try to post more often! Addie Lee is like Handy Manny. 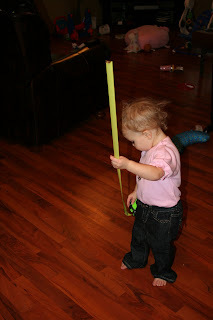 She found the tape measure and Dustin put it on her pants and she just loved it! 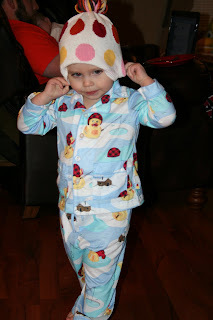 Y'all have seen Addie Lee's shoe fetish...she also loves hats! Also, check out these cool jammers! Aren't they cute! We got snow here in LA and it actually stuck! I got a "snow day" at work so I was able to play in the snow with Addie Lee. 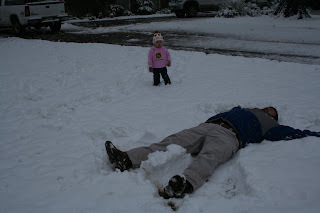 Here, Addie Lee is confused b/c her daddy is laying on the ground flapping his arms and legs. 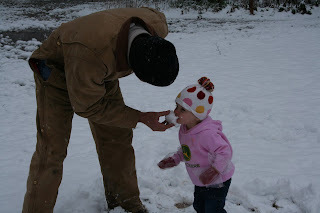 Here's Pop feeding Addie Lee snow. I just warned her not to eat yellow snow! 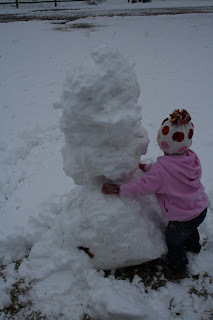 Addie Lee is hugging the snowman we made. She had the greatest time in the snow! This is Kimber in his snow outfit. 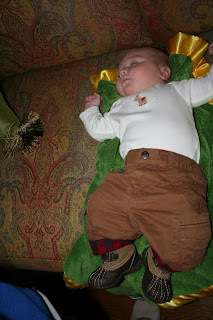 He had on his carhart pants and great boots! Check those out! 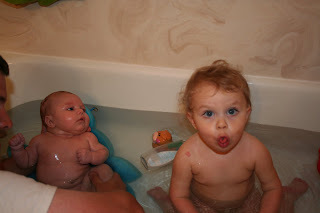 Addie Lee and Kimber's first bath together. Addie Lee loved it. Now, everytime she goes to take a bath she says "baby," she thinks he is to be in there each time she is taking a bath! It is so cute! Kimber loves Mama and Daddy's bed. This was one morning while I was getting dressed for work. He loves to watch the fan but that particular morning he was just too tired. Addie Lee showing me her "get her get her" hands. I always do my hands like that and say "I'm gonna get her get her." 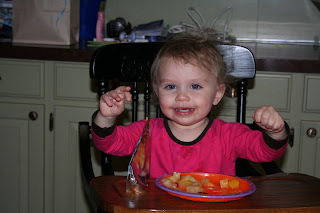 She started doing this and saying "get her." It is the cutest thing!